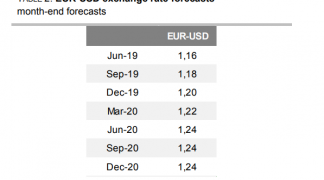 The Pound-to-Euro exchange rate is expected to rise to levels above 1.16 in a year’s time, while the Pound-to-Dollar rate will rise towards 1.40 according to the most far-reaching poll of analyst expectations available. Although most analysts expect a Brexit deal to be ratified by the UK parliament, it may take until the 11th hour before any such a deal is reached. Upside gains will as a result not be as great as losses in the eventuality of a 'no deal' surprise, according to a Reuters poll of institutional strategists and analysts conducted between January 31 and February 05. At the present time the the 1 GBP buys 1.1415 EUR on the inter-bank market while 1 GBP buys 1.2929 USD. The vast majority of those polled still expect the UK to agree on a deal with the EU rather than depart without a deal, which would be the costliest scenario for Sterling and the economy. “Reuters polls of economists have consistently indicated that they expect Britain and the European Union to eventually agree on a free trade deal,” says Jonathan Cable, a correspondent at Reuters. The Pound is likely to remain resilient right up until the last day even if there is no deal on the table because any agreement could be done via concessions made at the 11th hour. A mixture of uncertainty and broad optimism means the poll of strategists indicated the Pound will probably trade with ‘contained volatility’ within a fairly wide range up until the March 29 end date. In the event of a free trade deal being agreed the Pound will probably trade 2-5% higher whilst in the event of a no-deal it would trade 5-10% lower. From current levels, this translates into a rise to 1.1605-1.1945 for GBP/EUR if a deal is struck and a fall to 1.0810-1.0240 if not. For GBP/USD it means a rise to between 1.3215-1.3605 in the event of a deal but fall tom 1.2305-1.1660 if not. The forecast for GBP/USD regardless of Brexit is for it to rise due to Dollar weakness anyway, according to the poll, reaching a median level of 1.35 in 6-months and 1.40 in a year. The Reuters poll responses suggest most expect the Bank of England (BOE) to raise interest rates in a “slow and steady approach”, with a 0.25% hike being delivered in the third quarter 2019, and another in the first quarter of 2020. The BOE left interest rates unchanged at their February 07 meeting, but they did also downgrade growth and inflation expectations. A key driver of currencies is policy enacted by central banks since this affects net inflows of foreign capital. These tend to rise when central banks put up interest rates, driving up demand and value for the local currency. 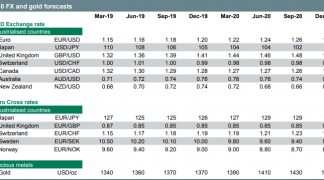 Institutuibak analysts meanwhile see the U.S. Federal Reserve halting its hawkish bias with regards to raising rates as the economy will likely see growth rates moderate. 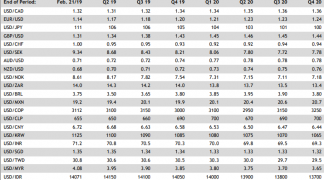 The European Central Bank (ECB) meanwhile is forecast to raise rates once in the fourth quarter of 2019, according to the poll, which is in line with the central bank’s strategy and probably marginally more optimistic than the current market consensus. The Euro outlook remains challenging owing to ongoing concerns over the area's economic growth outlook. The European Commission have released their latest set of economic forecasts for the European Union, which have been described by one analyst as being "rather gloomy". "This is well below the assumption in the 2019 budget and further questions the budget deficit assumptions by the Italian government and it could restart the budget fight with the EU," says Arne Anders Lohmann Rasmussen, Chief Analyst with Danske Bank. Recall the EU and Italy agreed on a 2.04% deficit in December. The Commission cut its 2019 Eurozone inflation forecast to 1.4%, down from previously 1.8%. "The market reacted negatively to the news and the 10Y Italian spread vs Germany widened almost 15bp. 10Y Bund yields dropped to the lowest level since 2016," says Rasmussen. 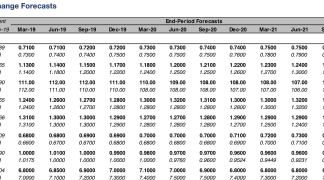 Danke Bank analysts expect the ECB will present lower growth forecasts when the staff projections are updated next month. "It could further trigger market speculations of new easing/postponing of tightening from the ECB," says Rasmussen. These are hardly the conditions within which we would expect the Euro exchange rate complex to flourish. Political tensions in the Eurozone were back on investor radars Thursday after France recalled its ambassador to Italy, something we believe last done when Mussolini ran Italy. The decision was based on "repeated, baseless" attacks by Italian political leaders against France. Reports suggest the decision was prompted following a series of insults from Italy, notably Deputy Prime Minister Luigi di Maio’s decision this week to meet with members of France’s "yellow vest" movement, which are engaged in a multi-month series of protests against the government of Emmanuel Macron. While there is no immediate route to a weaker Euro on the news, we believe this extends the narrative of a restless Italy being a potentially destabilising force to the architecture of the Eurozone, which if escalated would potentially pose significant risks for the single-currency.